"The Widow and the Clockwork Heart"
As another nod to the diverse history of the House of Ideas, this old-school anthology throws a small brigade of creators into crafting short strips on the themes of love and loss. The four strips can be summarized as "the clever one," "the sad one," "the dark one," and "the funny one." 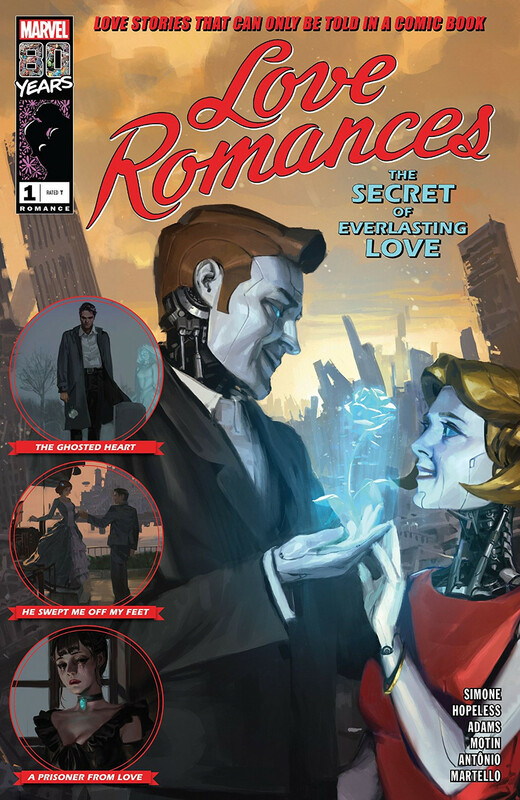 The clever strip is clever indeed, telling a story of second love in a fantastic, meta-fictional steampunk world. More than the others, it embraces the restrictions inherent in its short length, hanging everything (successfully!) on a Big Twist. The sad strip is a no-dialogue cartoon the examines grief and loss from a novel, supernatural perspective. It has heart, but brevity and the commitment to visual-only storytelling limit how much it can say. The dark strip is a moody piece on love finding its way past an overprotective father. It relies on ambiguity to plant itself in the reader's memory, leaving one big question unanswered about how it achieved its happily ever after. The funny strip runs wild with absurdity, doubling and redoubling its science fiction stakes over several centuries. It follows an unfortunate nebbish who downloads himself into a robot body just in time for his marriage to fall apart. It strings together plenty of goofy gags, but overall, there's something too cold and calculating in its plot. This is a very pretty book from cover to cover. Each strip has a distinctive style and all are executed with considerable passion. The clever strip is bursting with detail, the sad strip finds purity in its clean style, the dark strip enjoys a remarkably successful two-tone palette, and the funny strip's ambitious story is served well by the most conventionally "comic book"-y art style in the anthology. There's nothing truly regrettable or disappointing in this book, but it doesn't really deliver enough quality to demand readers' attention. This is a take-it-or-leave-it book. That would be fine for one installment in an ongoing title, but a one-shot needs to go further and establish itself on its own merits. Love Romances #1 does not do this. The first strip, the clever one, sets a high bar that the subsequent strips don't quite clear. That tinges them with an unfair sense of disappointment. Even simply reordering this issue and placing the clever strip at the end would have helped tremendously.